I’m pretty comfortable with my Linux setup now. Krita has held up well in terms of drawing index cards on my tablet PC. I’ve set up a few brushes similar to the ones I used with Autodesk Sketchbook Pro, and I have a script that makes it easier to import and scale a layer. Being on Linux has also allowed me to write a bunch of command-line tools that would’ve been more difficult to do under Windows, and I’ve been taking advantage of the automation possibilities. It’s been a good month for Emacs-related things. 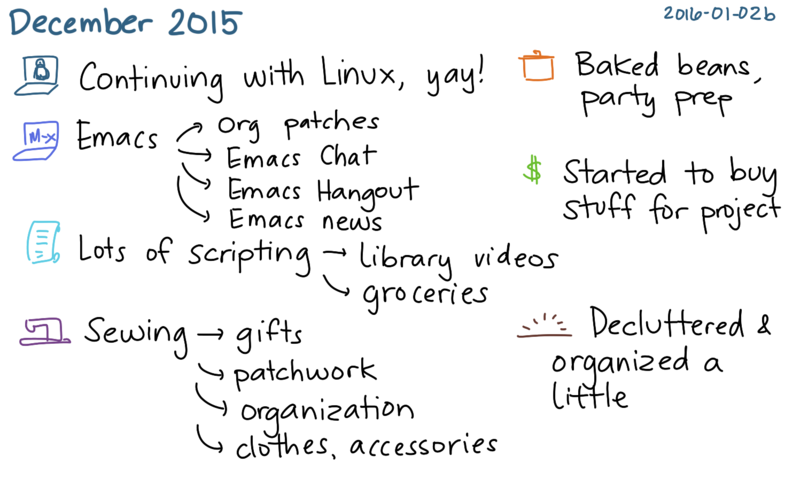 I’ve been refining my workflow for collecting and organizing links for Emacs News. I also had a quickly-scheduled Emacs Chat with John Wiegley about life as the new maintainer of Emacs, and the Emacs Hangout went well despite the issues at the beginning. The fabric I ordered from Fabric.com arrived in time for me to make gifts and send them off, and the package arrived in time for my family’s Christmas party during their vacation in California. I also sewed a few more clothes and accessories, organized my sewing materials, and turned some of my scraps into patchwork. I might actually be getting the hang of this. Lots of cooking this month, whee! Baking season is in full swing. I’ve been making a pot of baked beans almost every weekend, and it’s become my standard breakfast. I felt a little more tired than last month. I’ve been sleeping almost an hour more each day – almost ten hours a day, total. Ah well, such is life. It’s good to have the flexibility to sleep when I need to, and to be able to make the most of the other hours of the day when I can. I’ve been organizing my files, automating processes, and simplifying our life in preparation for even more fuzzy-brain times ahead, and I think this will pay off well. 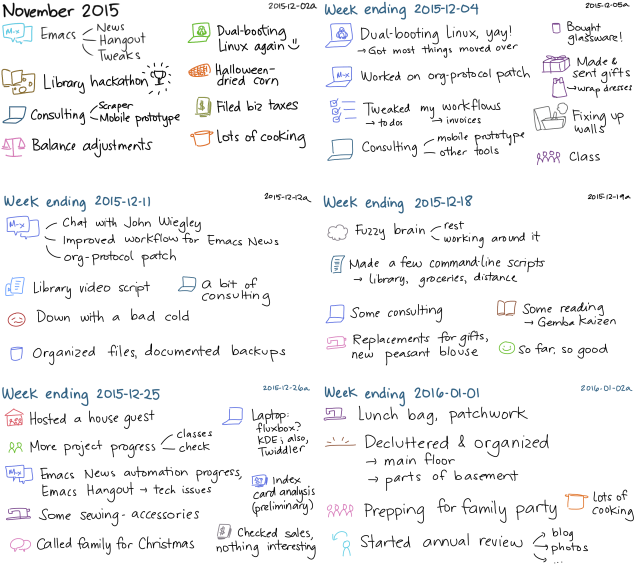 Less energy and concentration this month, but I still managed to get a lot of things done. Lots of cooking and personal projects, less consulting.